This topic has 3 voices, contains 19 replies, and was last updated by TB Support 489 days ago. First of I would like to give you a huge thank you for your quick replies and patience in helping me getting my website ready and answering all my questions. I really appreciate it! I have a question about the font colors. As you can see on my website, I use dark and light colors, so I would like certain texts or titles to fit the color scheme. However, I can only set it to one specific color. For example all links would have the same color, but the links in the header I would like to have white. I saw that I have the option of creating a new color rule, but unfortunately I don’t know how to do that. I also can’t, for the life of me, figure out, how to make my logo appear. It is a gif file. Does that have something to do with it? 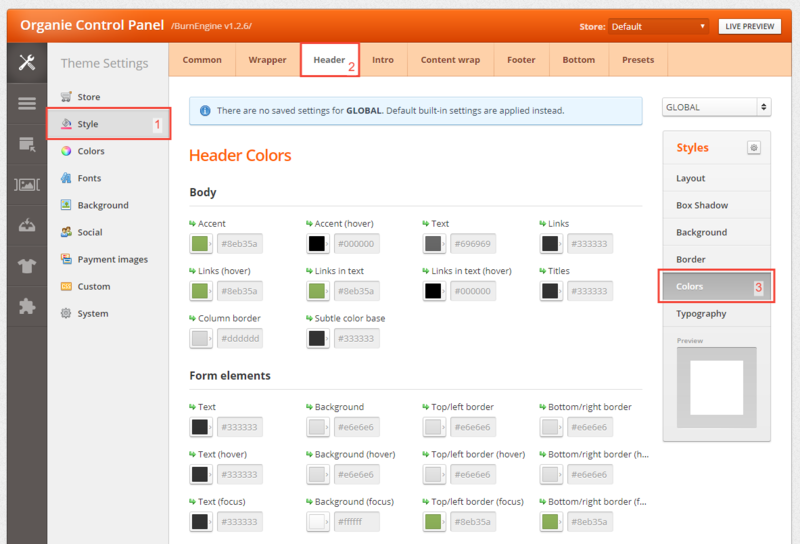 - Specific block colors can be modified from Page Builder > Header. 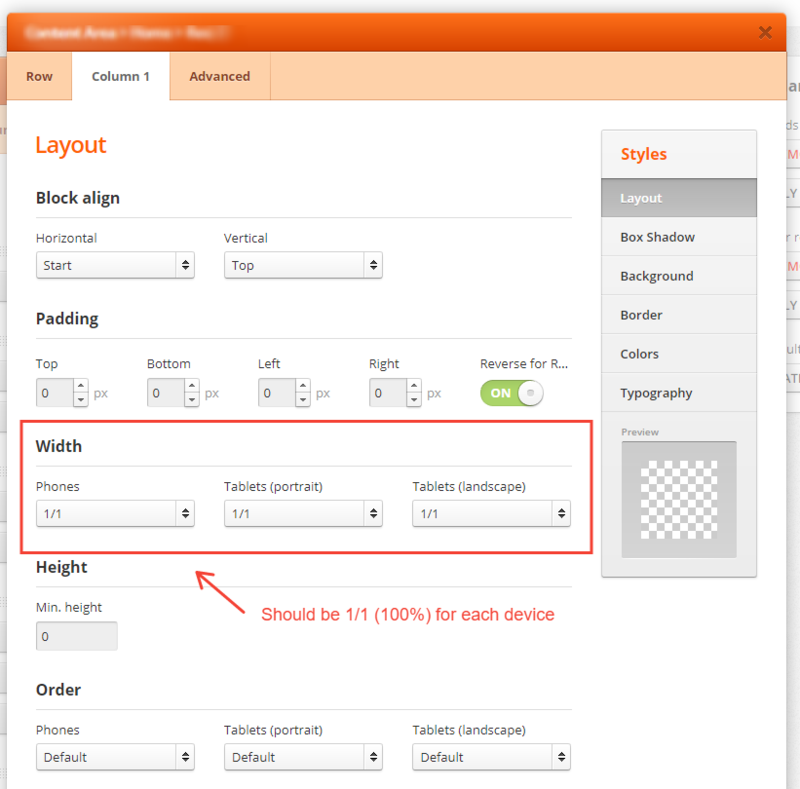 You need to select a row or block and check its color settings. E.g. your welcome and cart links inherit colors from the first row. About your Facebook like widget, you need to check it’s color settings. 2) Your logo needs to be set from Admin > System > Settings > Image. thank you very much for your reply. All the colors and the logo are perfect now! I have a couple more questions about the mobile view. a) when I have the landscape tablet view, the banner on top of the content does not spread over the entire page but is only to the left. Is there a way to change it? I would be happy if it were centered if it can’t be stretched to fit. b) in the header of the portrait view of the tablet as well as phone view, I would like to have the main menu and cart buttons left and right of the logo rather than underneath. Is there a way to change that? b) We will need to check your Header > Logo settings. Can you please provide admin access? Thank you for your help! the banner is fixed. While you check the tablet banner would you mind also checking into why the contact/facebook like box are not side by side in ipad landscape view? And would you also be so kind as to take a look at the seo mode? when I have it turned on any site besides the homepage is ‘under construction’ in the front end. This reply was modified 643 days ago by serafinafae. 2) The “under construction” problem is presented when using the default theme too and is not theme related. Most likely there is some modification that is causing a redirect. The requested URL /home/reiki-session-windsor-essex-ontario was not found on this server. In your last reply you mentioned that this problem could happen when the default theme is used as well. Could you clarify that, please? I don’t understand what I am supposed to do to change it. PS: should you need access to my website, the login and password is in a message above. Can you please check if you have set your .htaccess correctly. After initial installation you need to rename the file from .htaccess.txt to .htaccess. The requested URL /home/jewelry/spiritual-jewelry was not found on this server. Do you have an Appache or NGINX Server? Ok, the SEO Url links are working now. YAY!!!! But….. now the pictures on the product pages do not show. They are visible on the front page and in the categories, but not on the actual product page. We changed the htaccess file and that’s when it happened. We changed it back for now since the pictures would also not show anymore when I switchted back to regular urls. Any ideas about what could be wrong? This reply was modified 571 days ago by serafinafae. Most likely this is linked to your htaccess problems. Why don’t your restore OpenCart default htaccess settings? We tried everything you suggested but nothing is working. Still neither the pictures nor the reviews on the product pages show up when I set my website to SEO URL Mode. I really don’t understand where the problem could be. Is there any other reason why this may not be working? We will need the website admin and ftp access, so we can check.